Preheat oil in Presto® electric deep fryer. If using an adjustable thermostat deep fryer, set at 350°. Working in batches, gently drop tortilla wedges into hot oil and cook until crispy and golden on both sides, turning as needed, about 1 1/2 minutes per side. Remove and drain on paper towels. Combine cumin and salt in a small bowl, sprinkle over chips to taste. Serve hot. PRESTO TIP: To keep chips warm while frying the remaining batches, place them on a baking pan in an oven preheated to 200°. Adapted from Homemade Tortilla Crisps recipe in Chef Kevin Belton’s Big Flavors of New Orleans cookbook. Clean and rinse chickpeas. Add chickpeas, water, and salt to the cooking pot in the Presto® Electric Pressure Cooker Plus. Press BROWN and bring to a boil. Allow beans to boil for 1 to 2 minutes. Press CANCEL; cover pressure cooker and let beans soak 1 hour. Drain beans and rinse well. Return beans to cooking pot; add 3 cups chicken stock. Close cover. Place quick pressure release valve on vent pipe. Press BEANS and then adjust time to 16 minutes. When time is up, allow pressure to drop of its own accord. Drain beans. Add chickpeas, tahini, oil, 1/2 cup chicken stock, lemon juice, garlic, and cumin to blender or food processor. Process about 1 minute. Open cover and check taste and consistency. Add additional stock if necessary to reach desired consistency. Season to taste with salt. Allow hummus to sit for 30 minutes to 1 hour to allow flavors to intermingle. Just before serving, garnish as desired. 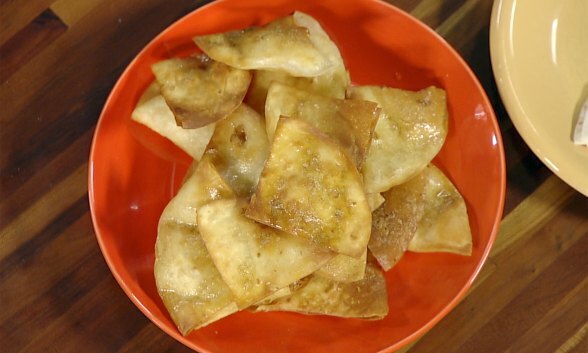 Watch Chef Kevin Belton prepare Homemade Tortilla Crisps in this video.